PROFESSIONAL DENTAL ROTARY INSTRUMENT MANUFACTORY! Highly cost effective, Thoughtful sales-service, Fast delivery ! 1.Material:Diamond grits mixing with plate metal binder. 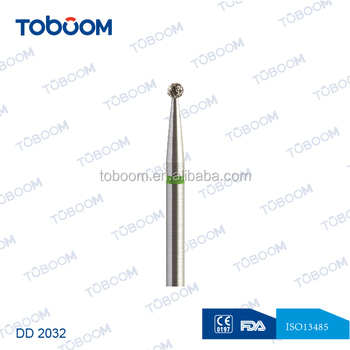 2.Usage:For finishing,carving and smoothing the slight parts of all kinds of dental workpiece,such as steel teeth /steel frame/inner steel crown(not suitable for the out face of the crown)porcelain teeth .resin teeth/resin base. "2"------HP shank (diameter- 2.35 mm).